The hardest hunting mission is the one that asks players to aim for the heart. Aiming for the heart isn’t easy as it is quite smaller than the lungs. Brain and heart are smaller and very difficult to aim and shoot, even with the Infrared on. But there’s a workaround: You will need to upgrade your sniper rifle’s “Barrel”, “Muzzle” or “Stock” to increase “Stability”, which will make the rifle less shaky as well as Zoom and Infrared. Tap on “My Rifle” to check the upgrade cost of each rifle part and the point boost they will give to your rifle’s stability and other attributes. Upgrading Barrel will give the lowest point boost whereas Upgrading Stock will give the highest point boost, but will require more cash. Also, upgrading Stock only boosts stability whereas upgrading the other two rifle parts increases power and stability. After Stability, it’s time to boost your sniper rifle’s “Zoom” ability. 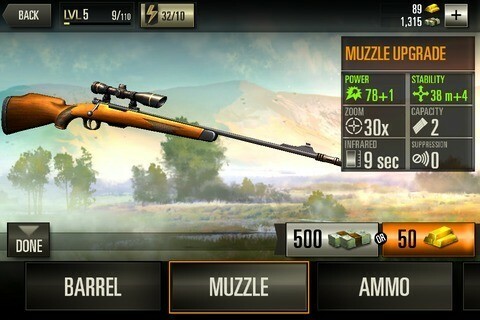 Upgrading “Scope” will let you zoom in on your prey’s internal organ even closer. Heart or brain is quite smaller than the lungs and so you should get a bigger view of it for an easy aim. Next, upgrade your infrared to give it a time boost. Infrared vision stays for a few seconds and then fades away pretty quick. In such missions, even a second counts and so upgrading “Infrared” to an extra second can make some difference in the overall hunting experience. Note: Even after upgrading required parts to qualify for such a mission or series, you should still upgrade the above parts for optimal hunting experience in body part shooting missions. In missions that let you aim and shoot a specific internal organ of a prey, don’t just press the infrared button right away after zooming in on your prey. Precious seconds will get wasted if you try to adjust the aim after zooming and pressing the infrared button and we all know that infrared vision stays for only a few seconds. First tap on the scope button, drag the zoom slider, keep the aim closer to the target organ (could be lungs, brain or heart), and then press the infrared button. After playing a few missions, you may have an idea where an animal’s lungs or heart is, so it will be easy for you get a rough idea where your prey’s internal organs are. Winning contract missions are easier than winning “series” missions. If you want to earn quick bucks, then contract missions are your best bet. Even the upgrade costs are lower than series missions. Cash-strapped hunters should go for contract missions in case they have less money to upgrade for the higher prized missions. Shotgun contract missions are a much better bet than AR contract missions because the latter requires buying a rifle with gold. Also, shotgun contract does not have those missions that pin-point a specific internal organs to win, plus the rewards are as good as normal “series” missions. In some Deer Hunter 2016 missions, you will have to hunt more than one animal using a sniper rifle. When you shoot and kill one, the alert meter (shown by an exclamation mark) fills up and changes to color red, indicating that all animals have been alerted by the noise and are fleeing the scene. It’s hard to hunt down an alert prey with a rifle. To take them out, quickly tap on Swap, select a Shotgun and start aiming and shooting running animals without using the zoom option. You may use the zoom option to zero in on a group of fleeing animals and then shoot (you don’t have to be super accurate). Even if it does not kill, it will surely slow them down, making it easier for you to take them down in the next few shots. This is a no-brainer, but it does make it easier for you to aim and shoot. Use the left thumb to adjust the aim and the gun’s direction and the right thumb to press the shoot button. This will make it simpler for you to take out your target. Use both thumbs for sniper rifle missions also – tap on the scope button, move the zoom slider to max in case you have to target an internal organ of your prey and then move the aim towards the target. Keep holding the touch screen with your left thumb to keep the aim stable soon after you zero in on the target and then press the fire button. You get free energy on certain hours of the day. Make sure you have switched on the game’s notifications and haven’t’ switched off your mobile device if you want to claim free energy. 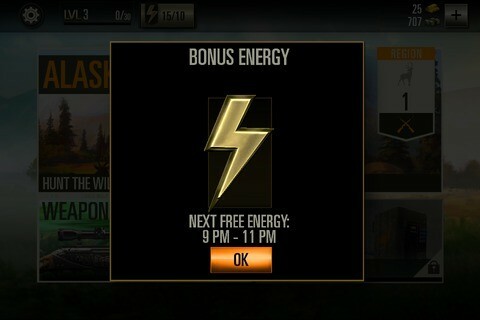 Once you have claimed energy, another pop up box will show the next timings to get free energy. The free energy gets stored and added to the total energy and even goes past the energy limit, but that does not mean the extra energy goes to waste. It gets added to the total energy count. So get free energy, stack it up and use energy points to play various mission types. Some animals can be quite menacing. They will charge at you and maul you down if you don’t act quickly. You must be pretty quick to take them down before they kill you. Such animals can attack after killing your prey or when you missed a shot. If you see one charging at you, quickly take out the scope and try to shoot at your prey when he is at close range or press “Swap” and choose a shotgun to hunt it down. Keep on playing missions – contract missions, general missions and special series (if you have the required upgraded rifle parts) and level-up to earn gold and extra energy. Use the extra energy again to play missions and earn more gold energy. 1. Keep an eye on the alert meter. In some missions, you will need to shoot and eliminate a creature before the alert meter fills up. Once it’s full, your prey will try to flee away from the scene and it will become quite difficult for you to hunt him down. 2. In special series missions, yes the ones that need to be completed so that you can unlock a new region, you may receive a big gold reward if you complete a challenging hunting mission. You may have to watch a 30-sec reward to get gold. Save gold only for guns. 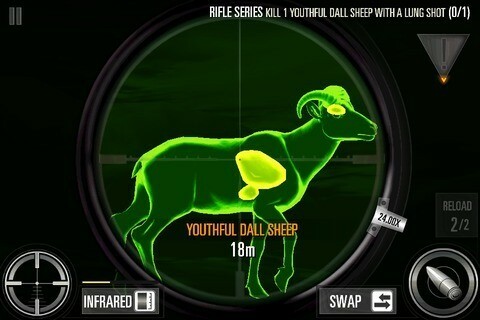 Note: This guide explains how to get the best virtual mobile hunting experience. 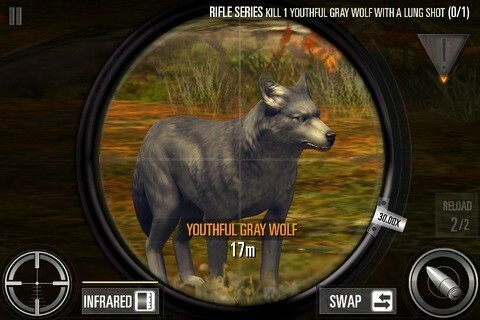 It’s a game and these tips and tricks may help newbie hunters hunt virtual animals for rewards.